Many criticize me because I watch cartoons and teen series. Sometimes some people stare at me with a strange look meaning: you-are-too-old-for-it. According to them, I qualify to watch Criminal Minds, Bones, and CSI. But honestly, these shows are more childish than the shows in Playhouse Disney. Series about attempts to escape from prison, airplanes falling on islands, or vampires who engage in romantic relationships are a step backwards in emotional stability, and (depending on the series) in the critical and analytical capacity of an individual. For example, when comparing Vampire Diaries with Phineas and Ferb, one can see that the series about vampires is just entertainment for teenage girls, while the cartoon is responsible for developing the intellectuality and character of a child. 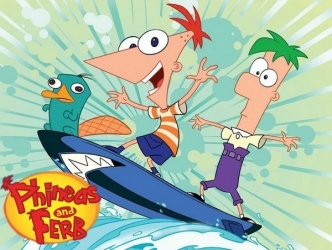 Phineas and Ferb are two young, creative inventors, who instinctively follow the standards of meritocracy. The fact that the two are very young, for example, to use reverse engineering or to explain quantum physics is repeated in the show, but the kids never get discouraged and never think about quitting. But probably (of course there are always exceptions) Vampires Diaries fans have never heard of reverse engineering, and probably never understood quantum theory, but a children's program is so much superior that it teaches these concepts to children whose parents block the Warner Channel. Of course the plot of cartoons is suitable for young children, but it is an intellectually much more intellectually active than spending hours mesmerized by Two and a Half Man. And obviously not all children’s series are good for the mind (I highlight the poor performance in My Wife and Kids and the poorly written plot of H2O, Girls Sirens). And not every adult series is a disaster for the mind (for instance, the wonderful satire to Western customs in The Simpsons and in Friends. Also, CSI makes a few neurons work, but just a few.